Records available at Manhattan central office for Acacia/Machpelah/Mokom Sholom. Records can be retrieved by date of burial. Founded by Congregation Agudas Achim of Setauket, which was active from 1893 until 1914. Later acquired by Temple Israel of Riverhead, P.O. Box 1531, Riverhead, NY, which has records only for the burials that have occurred during its ownership. The cemetery is hard to find because there's no sign. It's on the east side of Mud Rd., about 0.1 miles north of Ridgeway Avenue. A broken asphalt driveway leads to a chain-link fence with an unlocked gate. The cemetery shows up in the Hagstrom atlas of Suffolk County. Founded in 1932, the cemetery has two graves somewhere in a totally overgrown & ownerless cemetery. Records are on microfiche and arranged alphabetically by last name of the deceased. Records after 1901 are cross-indexed by date of burial. This is a non-Jewish cemetery that has a few Jewish burial society plots in the New York Bay section. New York Bay Cemetery merged with Bay View Cemetery. Some records have been computerized. Basic indexing is by deceased's last name. 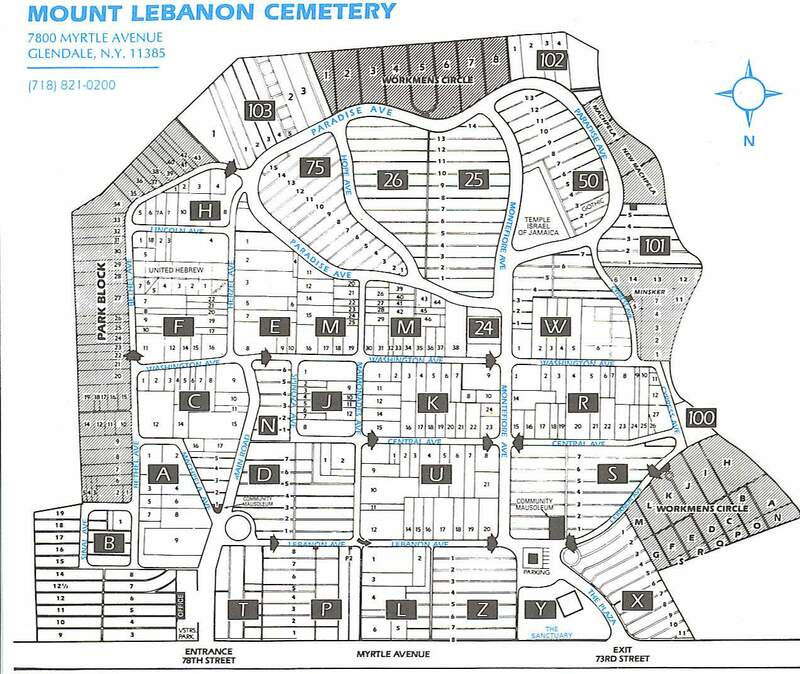 Plot maps exist for landsmanshaftn/burial society areas. First burial was in 1918. This is one section of the same cemetery as Cedar Park. Interment database Records are available by burial date or alphabetically by last name of the deceased. 3. Shaaray Tefilah, 250 East 79 St, NY, NY 10021 (212) 535-8008 Records are available at the cemetery office and at each congregation. The cemetery is owned by Congregation Shaarey Tefiloh/Shaarey Tefiloh Cemetery Association. See Grove Street. This is one of four cemeteries in the Grove Street/South Orange Avenue area. See McClellan Street Cemeteries below. See Lindenhurst Hebrew Congregation. This is a non-denominational cemetery founded in the 1880's. Lindenhurst Hebrew Congregation is the Jewish section. One section of the same cemetery is Beth El (Westwood). The congregation's original cemeteries are all in Manhattan. Their newer cemetery is Beth Olom in Brooklyn. The records for the Manhattan cemeteries are all at the congregation office. This is a non-sectarian cemetery that has several Jewish burial society plots. The synagogue is not affiliated with the cemetery. It simply serves as a place for receipt of mail and messages. See Menorah. This is a non-denominational cemetery. Menorah is the Jewish section. Some records are cross referenced by burial society plot. Records are arranged alphabetically by deceased's last name and by burial society. Note: Grove Street Cemetery is located on Grove Street between South Orange Avenue & Central Avenues. Talmud Torah is on South Orange Avenue opposite #616 South Orange Avenue Union Field is on the opposite site of South Orange Avenue between S. 20th & S. 21st Street. B'nai Abraham is on South Orange Avenue between S. 19th Street & S. 20th Street adjacent to Union Field. The parent organization, Mutual Benevolent Society, was founded in 1865 by 44 Hungarian immigrants on New York's Lower East Side. The cemetery was opened in the late 1800's. See Sharon Gardens. This is a non-denominational cemetery. Sharon Gardens is the Jewish section. Cemetery is located on border of Kings Park and Commack in residential development called Country Woods on east side of Indian Head Road. Contact person is Gary Spiegel at 631-724-6321. This congregation owns the property for Jewish burials within the non-denominational Breslau Cemetery. Records available at Manhattan central office for Acacia/Machpelah/Mokom Sholom. Records can be retrieved by date of burial. Records are poorly organized but can be retrieved by date of burial. Harry Houdini is buried here. Includes many burial societies including Bnai Israel Cemetery and Gomel Chesed. These society plots cluster around McClellan Street and Mt. Olivet Avenue in Newark. The cemetery sign refers to the overall name as Mt. Olivet Cemetery, with smaller signs indicating the landsmanshaft plots. Jewish section of East Ridgelawn Cemetery. Records available at Manhattan central office for Acacia/Machpelah/Mokom Sholom. The office has poorly organized records and poor plot maps. You must have the date of death to retrieve records. Recent burials are computerized. Owned by Springfield Long Island Cemetery Society. Records are available by burial date or alphabetically by last name of the deceased. If your search is unsuccessful, see also: New Montefiore. Each cemetery has its own records. NOTE: Do not search both Montefiore and New Montefiore at the same time, close the browser in between. Records are arranged alphabetically by last name of deceased, chronologically by date of burial, and by burial society. Interment database can be searched by any combination of these variables: first name, last name, date of death (month / year), block number, reference number, and name of society. Block is the first number in each grave's location code; reference (path) is the second number. Maximum results are 200 burials per search. Block maps refer to Section #1 (opposite side of Cypress Avenue) and Section #2 (same side of Cypress Avenue as cemetery office). See also: Highland View Cemetery Association. Mt. Lebanon, New Mt. Lebanon and Mt. Lebanon Part 2 are all part of the same cemetery. They are bounded by the Garden State Parkway, U.S. Highway Route 1, Mt. Hope Avenue and Forest Lawn Memorial Gardens Cemetery. Website contains a List of Organization, Society & Cemetery Sections.Also Searchable Interment Database. Website contains a Grave Locator where you can search by individual (last name and/or first name) or by organization name. The individual search will provide you with the last and first name, burial date, organization, section, and the location on the cemetery grounds map of the entire section (but not the specific organization). The organization search will not provide you with the name of anyone in a burial society, but rather will just highlight the location on the cemetery grounds map of the entire section (but not the specific organization). Mt. Moriah also owns Fairview Cemetery, 500 Fairview Avenue, Fairview, NJ 201-943-6161. Fairview is a non-denominational cemetery that has no Jewish section, but may have Jewish burials. Their records are computerized. Records can be found at both the cemetery office and at the Hebrew Free Burial Association. Most records are on microfilm and are arranged chronologically by burial date. The last couple of years have been computerized. This is the Jewish section of Washington Memorial Park, a non-sectarian cemetery. Opened as Elmweir Cemetery. Their records are well organized by last name of the deceased, chronologically by date of burial, and by burial society. They have good maps of each of the burial society plots. Records for grave sites that are under active care have been computerized. Interment database can be searched by any combination of these variables: first name, last name, date of death (month / year), map/path number, block number, and name of society. Maximum results are 200 burials per search. If your search is unsuccessful, see also: Montefiore. Each cemetery has its own records. NOTE: Do not search both Montefiore and New Montefiore at the same time, close the browser in between. Block maps refer to this cemetery as Mt. Carmel Sections No. 2 & No. 3. Records are available from the old Mt. Carmel Office. First burial was in 1906. Interment database can be searched by any combination of these variables: first name, last name, date of death (month / year), section number, block number, map/path number, and name of society. Section 2 or 3 (for New Mt. Carmel Cemetery) is the first number in each grave's location code, followed by the block number, followed by the map/path number. Maximum results are 200 burials per search. Alphabetically by last name of the deceased and chronologically by date of burial. See Bay View -New York Bay Cemetery. At the extreme southern end of Bergen County. Across the street from the cemetery is Kearny, Hudson County. Records are not clearly organized. This is a Catholic cemetery that has Jewish burials towards the back. The cemetery has the Jewish burials on file..
A portion of this cemetery is owned by the Hebrew Free Burial Society/Mt. Richmond and the records are at Hebrew Free Burial Society/Mt. Richmond. Managed by the Oheb Sholom Cemetery Association. Records can be requested from Harriet Gordon c/o the P.O. Box address. The cemetery was founded by Patchogue Hebrew Congregation now Temple Beth-el of Patchogue around 1893. Contact person is Dr. Girshoff. Was founded as Saddle Brook Cemetery. Records are available chronologically by date of burial, and by burial society. Grounds Map indicates alphabetically-lettered blocks, but not society names nor their map number locations. Cemetery for the Jewish Center of the Hamptons, 44 Woods Lane, East Hampton, NY 11937 (631) 324-9858, Ext. 405. Contact: Sol Schiffman, 1 Fernwood Drive, Fairlawn, NJ 07410. Records are in his home. The temple is located at 112 East 75 Street, New York, NY 10021 (212) 249-5000. Some records arranged by burial society. Indexes also available by last name of deceased and chronologically by burial date. Maps are also maintained for landsmanshaftn/burial society plots. Records can be retrieved alphabetically by deceased's last name, chronologically by date of burial, and by burial society. They have excellent maps of each burial society plot area. Disclaimer: The Jewish Genealogical Society, Inc. and its volunteers are not responsible for any accident, injury, illness, or loss occurring in a cemetery, or in transit to or from a cemetery.